merit making, originally uploaded by c_p_lew. There are a lot of merit making ceremonies before the Lao New Year. Villages get together and collect donations at each store and people in each house will have a fund-raising ceremony sometime during the year - aside from money they also bring items that the monks need during the year such as robes, flashlight batteries and laundry soap. These small ceremonies are called Kathin. Often families will bring materials for each other the monks, in orange buckets and wrapped with orange cellophane. In this picture, the women at the end of the line bring the 'money tree' to the temple followed by a crowd of people from a village near the temple. 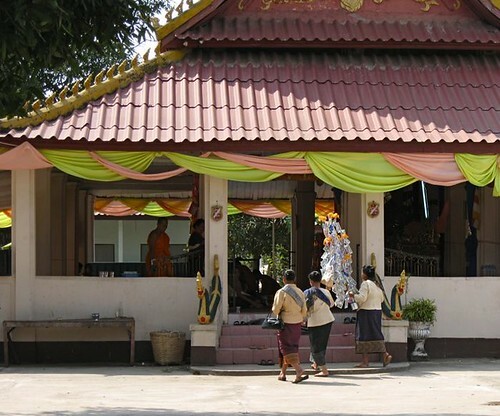 After circling the temple three times with their offerings they enter the temple to join the monks in chanting. There are also big merit making ceremonies, call Maha Kathin, maha being the Pali word for 'big'. Families will do this kind of ceremony every five or six years. The first day of the ceremony is in preparation, bringing all the items that people are donating, and gathering them on a bed with a canopy over it (I believe this symbolizes the reclining position of the Buddha when he left his human form to enter Nirvana. The following day, monks come to the house to chant in the early morning and people offer food. Then people go to the temple and make the offerings of the money and other articles that have been donated.